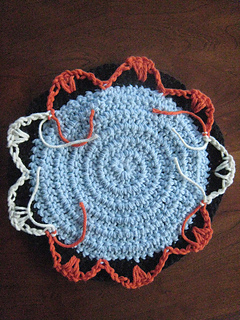 This pattern is based on project photos of Nancy Gates’ Stargate Coaster (which is no longer available). The interior of the stargate is done in dc and the outside in sc. Long sc are used for the chevrons. The “round” spiral pattern is my own as are the chevrons. CC2 and CC3 are used for the chevrons, but they, as well as the rest of the Stargate, can be done in any colors desired. 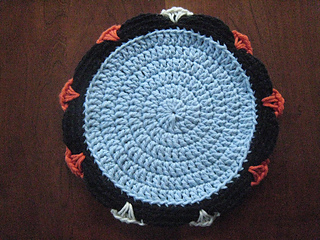 The coasters were made with scrap yarn. The 5” size is good for a coffee coaster. The 8” size is good for the table.